But , I want to know how to assign Constraints to the JD Connector and what are source code that should be written in SDK ? I am using Arty 7. Kindly, see the attached pictures. I would suggest looking at the Pmod DA1 here as an example for the Pmod DA3 main.c PmodDA3.h and PmodDA3.c . The arduino code and datasheet linked on the Pmod DA3 resource center here will help with configuring the DA3_SPIInit(). I use a bread board to gain access to the signals going from and to the Pmod DA3 to the Pmod port. I use the logic analyzer function of our Analog Discovery 2 to see what is happening if I am having problems communicating with the PmodDA3. I believe you should be able to read the data from the multiplier and the constant in the bram and send it out through the PmodDA3. For the BRAM you should use the functions in 'xil_io.h'. and for the PmodDA3 you will want to do something similar to the PmodDA1 main.c here. So you will need to put the bram value in place of dValue in the above function. Hopefully this gets you going in the right direction! Sorry for the confusion. You should add the PmodDA3 into the vivado library in vivado library folder: vivado-library\ip\Pmods downloaded from here. Here is the Getting Started with Digilent Pmod IPs tutorial that should help explain more about the IPs. Once you have looked through the xilinx example for the bram then I believe you should be using the bram code used in the testperiph.c file to help you with interacting with the bram in your main.c. The most current version of the xbram examples I believe are here. WriteSPI = Writes the byte array to the chip via SPI. It will write the first byte into the specified register, then the next into the following register until all of the data has been sent. I believe you should be able to use either function It depends on how you are wanting to transfer data. In the Vivado block design you should use the board tab and select the pmod JD instead of the pmod JA. Unfortunately, we do not have the bandwidth to create the SDK code for the Pmod DA3. Here is a list of our Pmod's that use the SPI communication like the Pmod DA3. I would suggest to look at the IP Cores of the SPI communication Pmod's that are in the Vivado Library as a reference for you to make the SDK code for the Pmod DA3 IP core. I would also use the Arduino code here and the datasheet here as a reference for configuring and using the Pmod DA3. Typically when I create an IP Core I first work on configuring the IC and setting up communication. This might require you to use a bread board and a o-scope to verify that the SPI signals are correct. Then I create the read and write functions. Lastly I manipulate the date to be in the form I would like it to be in. You should only need to alter the PmodDA3.c, PmodDA3.h and the main.c in the Pmod DA3 IP Core. It seems an experienced procedure. One thing is unclear for me. Which is you said I have to use an oscilloscope to verify SPI signals ! Do I need to SPI signals when using PmodDA3 module ? I am meaning that I am working with JA connector (GPIO) . Kindly, see the attached picture. And what is the procedure to verify SPI signals ? is there any reference to do that? Looking through your previous post it appears that I gave you an incorrect generic IP core. The Pmod DA3 communicates through SPI as shown on the Pmod DA3 resource center here and not through GPIO. I have attached the correct generic SPI IP Core below. J6 is a SPI connector typically associated with the Arduino/Chipkit header and used with a shield like the MTDS. Most of the Digilent SPI Pmod IP Cores are designed to use SPI through the Pmod Ports instead of the J6 connector. I altered the main.c code in PmodDA3 IP core, that you attached. Am I on right way ? And how to verify SPI signals on oscliioscpe ? In case I made the required connections (taps) to test the SPI signals, how would I know they are rights or wrongs ? Is there a reference for SPI signals? Here is a basic explanation of SPI communication. Here is the AXI Quad SPI v3.2 LogiCORE IP Product Guide, Here is the Pmod DA3 resource center that shows the pin out. By looking at the datasheet and the arduino code you should be able to see how the spi communication works for this specific Pmod. I don't know how to write a code that transfer the Multiplier signal to PmodDA3 . Kindly, see the attached picture of my design. And I also pasted the main.c code. as attached picture is showing that. Could, you tell me how to add the definition for Pmod interface (Pmod_out) , in order to suppress this critical warning? You need to make sure the ip repository is linked to the whole Vivado Library folder which includes the if and ip folders and not just the ip folder. Kindly, see the attached picture. I imported the IP as usual ! there is no "if" folder ! So , could you provide me with "if" folder that dedicated for the PmodDA3 ? 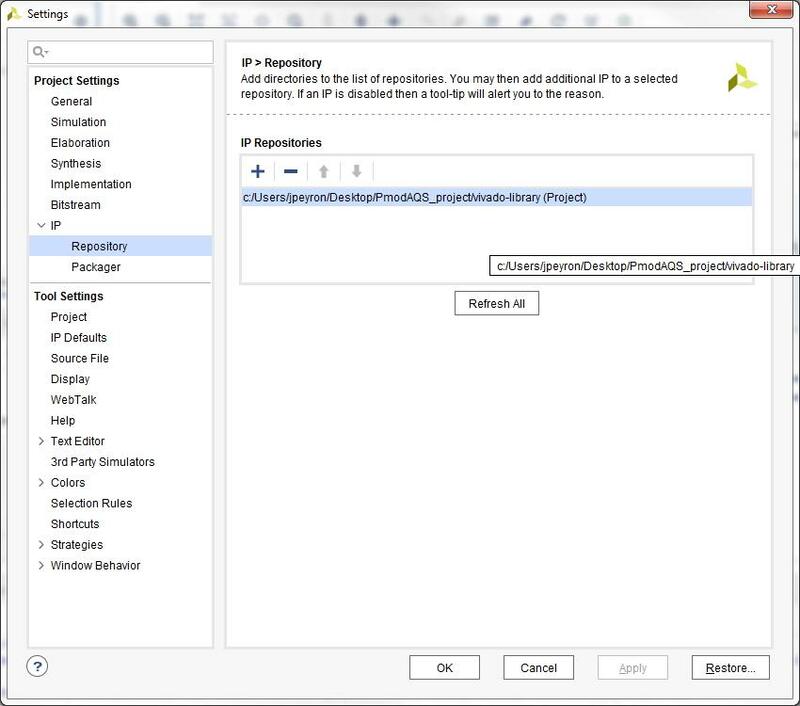 Please attach a screen shot of the IP repository by double clicking into settings under project manager and selecting IP and repository. I have attached a screen shot of this as well as the contents of the vivado library folder below. and not that located in vivado library. Because you updated the IP core to work with SPI protocol. So, back to our point, I still need the "if" folder. Because it is missed in link above. Thank you for your active follow up Mr Jon. In fact I looked through pg111 and I knew the purpose of each these above Macros, but the "U" isn't not mentioned in the manual . For what stand the "U" ? With a quick search I found on page 62 of the Native High-Speed I/O Interfaces it describes U. I believe that this idea is part of their #define for U. I would also suggest to reach out the Xilinx about this. I did a search for #define U with no results so I would guess that the #define U is not publicly shared by Xilinx. I attached a copy of my design . I exported the design to XSDK. Then created a new project with Peripheral Tests Template. The question is : where I have to add my own code , does it in testperiph.c or in main.c ? Thanks for your Support Mr Jon. Kindly, could you give me your feedback about this answer from Xilinx Forum. Does it true, that I have to work in testperiph.c file only ? My understanding is that you should be able to use the brams functions on you original projects "main.c.". I had suggest to make the xilinx example to be able to look at the way they use the function so you can better use them in your project. I would suggest to try and see what happens. Neither Xilinx or I have the exact hardware project that you are working on to verify our suggestions. 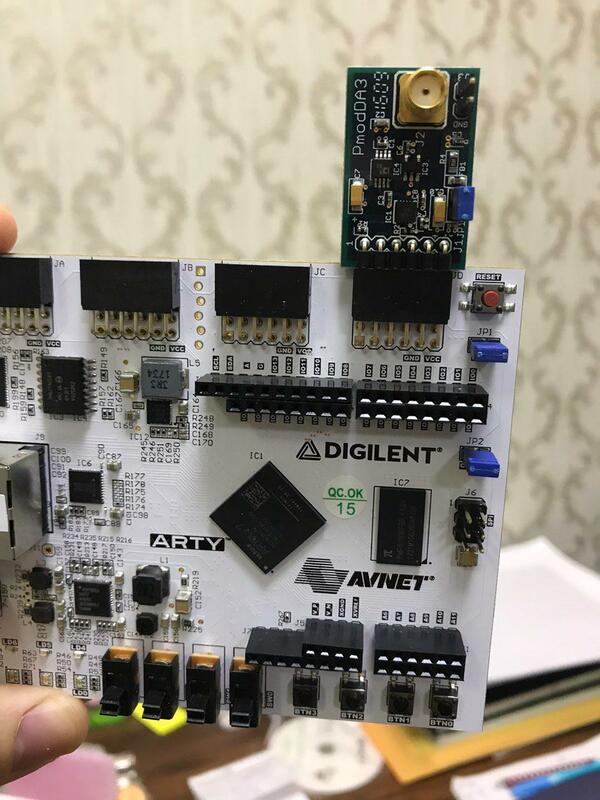 This might be a situation where you will need to spend some time evaluation what is going on in your hardware and c application.